Did President Barack Obama and Mursi MBs Used This Map? In 2009 the author sent two copies of his book titled: Arab Palestinians and Jews: Sociological Analysis, Amazon, 2009. The two copies were sent to President Barack Obama by the author. We wonder, wither the USA President used the map or not, during the Muslim Brothers in Egypt through President Muhammad Mursi or may the map inspires USA to implement it. We are not sure yet, until Mr. Obama or one of his advisors gives us an answer. If they did not see or use the MAP, then why Sinai came to be a part belong to radical Hamas? This outcome was not the intention of the author. The author, in fact explained the rational of that map in his book. Unfortunately, if it was used, some one owes apology to the author. Here is part from that message in the book: TO : Barack Obama, The President of the United States of America. “There is nothing more difficult to take in hand, more perilous to conduct, or more uncertain in its success, than to take the lead in the introduction of a new order of things.” Nicolo Machiavelli (The Prince). Almost one hundred years ago, in the time of Sykes-Picot, agreement included maps for the borders of the newly formed Middle East countries, where nations were established as Iraq, Jordan, Palestine, Syria, Lebanon, Saudi Arabia and Egypt. While Sikes and Picot were men like us, we differ from them by orientation and goals. Their colonial motive was behind their mapping which created the conflict in the whole Middle East, The noble motive behind this writer’s idea is a noble cause opens new method to reduce conflict and may solve the conflict completely if applied. The Sykes-Picot agreement was not to be as politically devastating as feared for the simple fact that, at tat point in time, the Arabs were advancing swiftly and assuredly against their Ottoman enemies. The Arabs felt that if they could make even further gains against the Ottomans that they would have more leverage in dealing with the imperial powers after the fighting had finished. The British were also advancing steadily through Palestine, capturing Jerusalem in December 1917. The British decisively defeated the Turks at Megiddo in September 1918, although the Arabs did manage to enter Damascus before the British were in a position to do so. The Ottomans capitulated soon after which left all of their previous dominions up for Arabs. 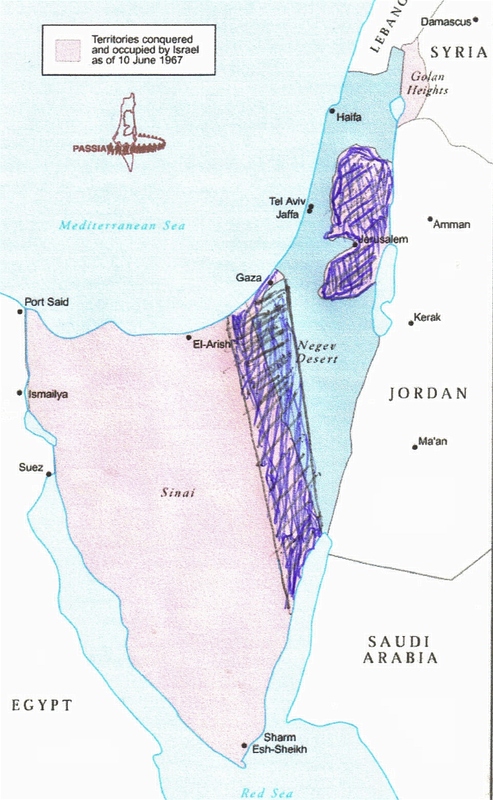 It is time NOW to revise such border maps concerning Palestine-Israel-Egypt to solve the Conflict in the Middle East. And the people decide their opinion about it. While I have the right to be angry as a Palestinian, Arab, Muslim, American, Philosopher, and human being, I also have the right to propose this map for the Future of Palestinian STATE which came after a long research done on the Palestinian-Israeli conflict. Ideas may come and go, what remains is their genius intuitive boldness and acceptability for noble purposes to reduce future tension and wars in the Middle East. It is a bold idea, might be accepted and rejected by some. Their justification will spring from authoritarian and legal rational modern thoughts and ideologies. I am aware of the disputation over the proposed map. The debate will be vast as a reaction to the proposed idea and Map worldwide [including Palestinian, Arab, Muslim and non-Muslim countries] . I believe that Egypt has the Key to solve the one-hundred Palestinian Israeli conflict. By its wisdom and hospitality to stop Israeli atrocities for ever, and help planning the future of the Palestinian State. A Proposal New Plan to solve the Israeli Palestinian conflict forever, is to adapt a new map for Palestinian state. Egypt Saudi Arabia and Israel [The Arab and Muslim world as well as the International community] Have to agree and adapt that map. The role of USA and EU is to convince in diplomatic methods all parts to accept the map plan to solve the conflict once and for all. This is the Proposed Map to be disseminated for Parties involved. Where the new Palestinian state is in dark blue- lines which includes Israel, West Bank and Gaza Strip, and Sinai-Egypt. The complete proposal may be found in Arab Palestinian and Jews: Sociological Approach, on Amazon 2009. This entry was posted in albahaspace, Arab Affairs, Arab American Encyclopedia, Arab Cluture, Arab flags, Arab Literature, Arab Manifesto, Arab Personalilities, Arab Philosophy, Arab Women Literature, Arabic Poetry, Articles, Business Management, Crescentology, Decision Making, Dryahyatv, Hasan Yahya حسن يحيى, History, Ibn Khaldun ابن خلدون،, Knowledge Base, Muslim Brothers and Egypt, Palestinian Interests, President Obama, psychology, Quotes of Wisdom, Religions and Spirts, Science, Sociology, Sociology of Education, منشورات الموسوعة العربية الأمريكية، كتب الدكتور يحيى ،, مهارة المدرسين وإدارة فصول, محاسن النساء والأخلاق and tagged Muslim Brothers and OBAMA, Obama and Muslim Brothers. Bookmark the permalink.